This sculpture, found at the entrance to It’s Tough to be a Bug, is of a very special chimpanzee named David Greybeard. Who is David Greybeard and why does he grace the Tree of Life? In 1960, Jane Goodall began her research in Gombe Stream National Park in Tanzania. Using unorthodox methods, including naming the individuals in the troop she was studying, she was eventually acknowledged as a member of the troop, the troop she stayed with for twenty-two months. The first of the chimpanzees to approach and welcome Goodall into the group was David Greybeard. Fast forward to the construction of Disney’s Animal Kingdom. Jane Goodall, consultant and friend of the park and Disney’s animal programs, took a tour of the wild places under construction with the Director of Animal Programs, Rick Barongi. While taking in the sculptures in the Tree of Life, of which there would end up being 325, Goodall asked Barongi is a chimpanzee was planned for the wienie. 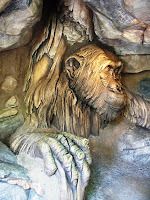 After consulting with the Chief Sculptor of the project, Zsolt Hormay, Barongi learned there was not a chimpanzee anywhere on the Tree of Life. That, however, was not good enough. Hormay and another artist took only a single week to craft a sculpture in the likeness of Goodall’s troop-mate David Greybeard. Upon her next visit, Goodall was shown to the spot where her friend would greet guests each and every day. In 1960, wildlife researcher Jane Goodall observed a wild chimpanzee as it carefully stripped a stick of its leaves and inserted it into a mound to fish for termites. This discovery that non-humans could create tools opened a door to a previously unknown world of animal intelligence, and inspired Jane Goodall’s life-long commitment to understanding these complex, amazing primates. To honor Jane Goodall, this likeness of the chimpanzee she called David Greybeard was created in the Tree of Life at Disney’s Animal Kingdom. I worked on the WDWCP in 1998. I was part of the opening crew for Disney's Animal Kingdom. We had a day called Press Day. We had a ton of celebrities, sponsors and executives in the park that day. We were allowed to walk around the park that day and enjoy the festivities if we "won" a special ticket. I was able to go and managed a picture of Jane Goodall standing in front of that chimp at the base of The Tree of Life. I was also able to speak to her for a few minutes. She is truly an inspiration and very, very kind.